*this is not a true statement, but it seems like it could be considering how much i blog about disney food. **talking about yourself in third person is weird. ***my friend and i partook solely in the food part, as we’re not legal at the moment. ****what why are you posting it’s not sunday night whaaaa?! i know. but this mini post didn’t feel appropriate to own a whole week in dng land, especially a week that long ago was already set for jasmine cream puffs. this week is alternating between some really cool/fun things and some annoyances/minor fires to put out in actual heather land, so i figured a touch of magic couldn’t hurt. now that all of that nonsense is out the way, we can move onto the food. our 3 day socal passes come with 1 magic morning. aka you can get in an hour earlier than everyone else. aka we woke up at 5:30am to get to disney. oof. 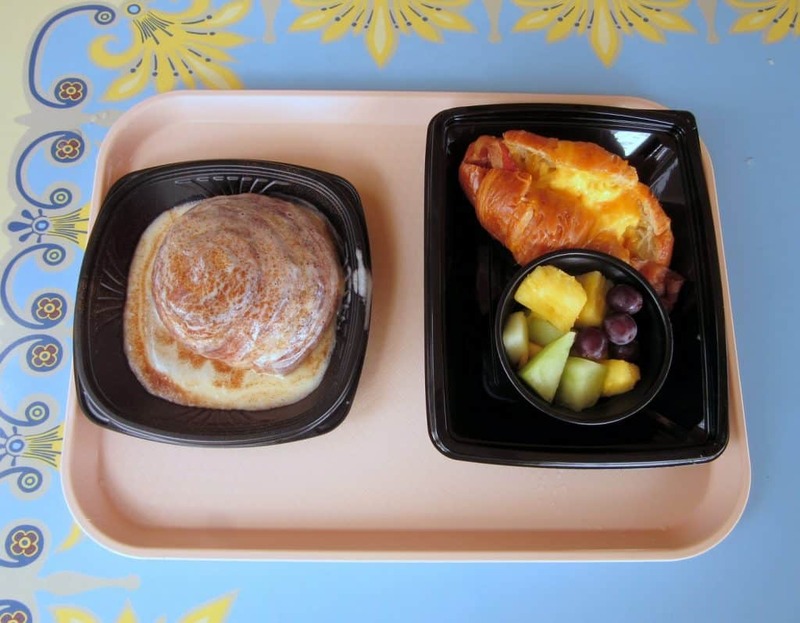 needless to say, we were fairly hungry by the time 9am rolled around, and stopped for a massive cinnamon roll with obscene amounts of cream cheese icing, as well as a bacon, egg and cheese croissant at the jolly holiday bakery at the end of the left side of main street in disneyland. the cinnamon roll was tender and fluffy and yeasty (i’m convinced that this is about on the same level of mild ick as “moist”), and i loved that it was cinnamon-y without being powdery. there was such a generous amount of icing that i left most of it on the plate, but it was a nice balance between tangy from the cream cheese as well as sweet from what i’m assuming is a buttload of powdered sugar. the croissant was fairly tasty, and was nothing more or less than what you would probably expect a bacon, egg and cheese croissant to be. but for $7?! a little too crazy for me. 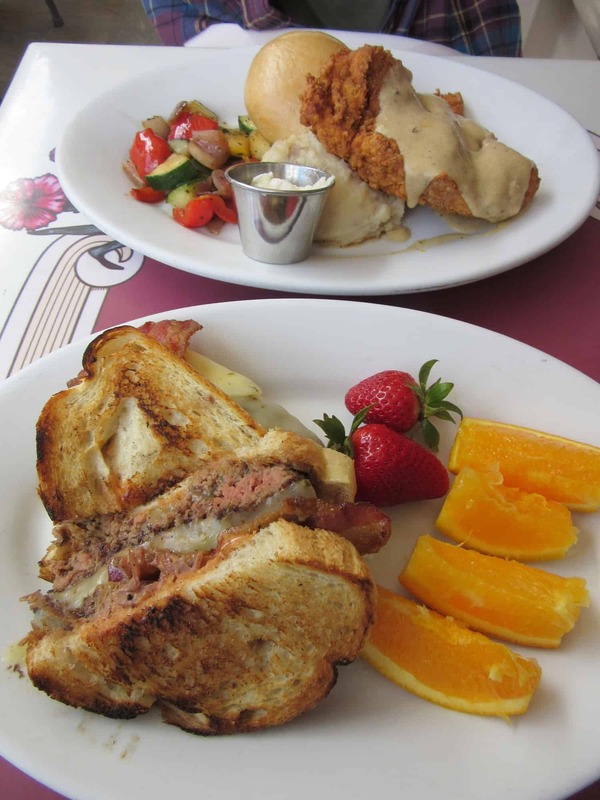 lunch was at the carnation cafe on main st in disneyland. my friend opted for the chicken fried chicken, which she has been lusting after since last november. we kept forgetting to make reservations early in the day though, and if you try to do it in the afternoon, welp, good luck. anyways, we got in, she ordered it, and found it kind of meh. i thought the chicken was pretty tender and the coating was crispy, but she preferred the chicken from both raising cane’s and black bear diner, both from a price/portion standpoint, as well as a taste one. i got a sourdough-bacon cheese melt, and it was good, but i was a bit dismayed at how fast the bread got soggy. as in, my first bite and the bottom bread was soggy. i do have to thank them for helping to curb my carb intake, since i ended up eating half of the bread. i didn’t think it was worth the reservation hassle or the money, and i’d recommend going elsewhere (perhaps jolly holiday). we also tried the lemon beignets, which are special edition for the 50th anniversary of the pirates of the carribean ride. these ones looked so good; the winter holiday peppermint ones were very mangled looking. while the dough is kind of whatever (it’s a little dense and bready, and fairly flavorless on its own), the taste of the shimmery gold sugar is evocative of lemon drop candies. maybe not the fresh lemon flavor i was looking for, but still tasty. so all the above things weren’t part of the food and wine festival. we only tried 2 desserts at the festival, because everything was so expensive. $7 for a handful of seasoned cauliflower? $5 for a sunset-colored drink that tasted like supermarket mango nectar according to the patron next to us in line? no, thanks. we first pounced on the lemon blueberry macaron, which had meyer lemon cream, blueberry marmalade and blueberry dust. the last of which my friend thought looked like mold (didn’t stop her from eating her half of the macaron though!). it was on the sweeter side, but i loved how lemony the cream was, and the texture from the blueberry marmalade was unexpected even given that i knew it was in the center of the macaron. continually impressed by the texture of disney’s macarons, and i think it’s a good deal at $5 considering it’s the size of 2-3 normal macarons. also, disney, if you’re listening: we would be 110% game for a macaron festival, and would gladly spend buckets on only your macarons. thanks. the other dessert, at the top of this post, was less successful. it was a hazelnut chocolate and raspberry feuillete tart, which is a very fancy way of saying a nutella and raspberry jam puff pastry tart. raspberry and nutella are typically a rock-solid paring, but it seemed very heavy together, especially with the doughy pastry. i don’t think we’ve ever been so disappointed by disney food, and had to go placate ourselves with free ghirardelli chocolate and another ride on the radiator springs racers in cars land. at which point i started asking how they randomized which car wins (my guess is that they trigger it when the actual “race” starts between the two cars, rather than have the cars pre-programmed as win or loss cars), and then we devolved into a semi-technical conversation that would have been very eye-rolling to listen to. our night ended with fireworks. or, it was meant to. but there were high winds, and they called it off. so we pulled down our dresses an inch (see below), sat down on the nearest curb, and waited until the stroller stampede ran through our section. and decided that ice cream was the only appropriate way to end our night. hot fudge is a pretty good send-off, in case you were wondering. I WANT TO SEE the inside of that MICKEY pastry!!!! Been a while, since our last trip to Disneyland. 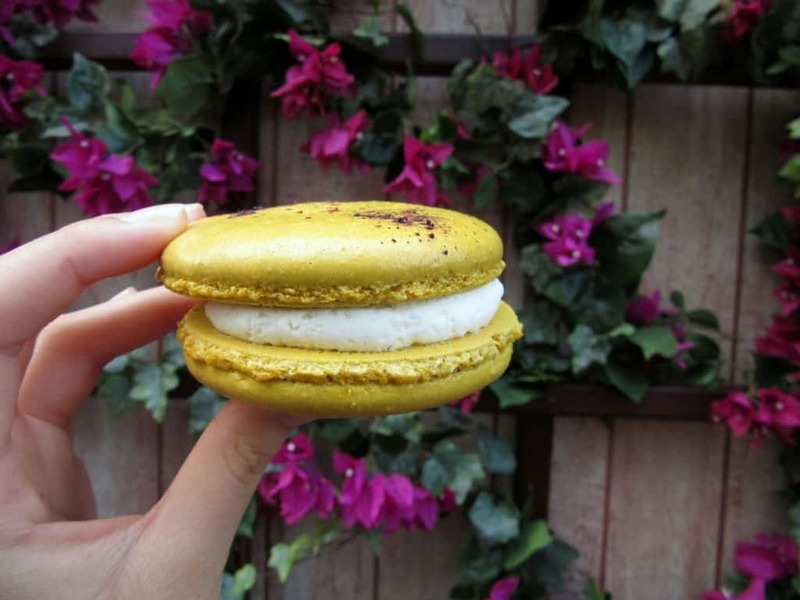 The meyer lemon macaroon with blueberry dust is intriguing…and that blueberry dust, YUM!!! glad you like them so much! i feel like i post one every month, so i tried to keep this one a teensy bit shorter, lol. if you don’t mind soggy sandwiches, then you’d definitely enjoy it more than me! i don’t like soggy carbs in general (i used to have a mini cooling rack to eat my pancakes off of instead of a plate, because i didn’t like them steaming up). glad i made you laugh (; this was a special edition macaron, but the usual raspberry rose and salted caramel are pretty good too! Oh my god that macaron!!!! I used to go to Disneyland all the time as a kid, this post brought back some fun nostalgic memories. I wanted to hear that the chicken fried chicken was amazing because I am a complete sucker for it…bummer! Have a great weekend! This seems like a great festival, Heather! The food is mouth-watering! the food was so mouth-watering! i wanted everythingggg (but my wallet and my friend were not down, sigh). gogogo! if you can though, i’d recommend waiting until november/december. from now until august it’s pretty hot and crowded, and it slows down a bit right before thanksgiving/in betweeen thanksgiving and christmas. plus, there’s holiday decorations up!! 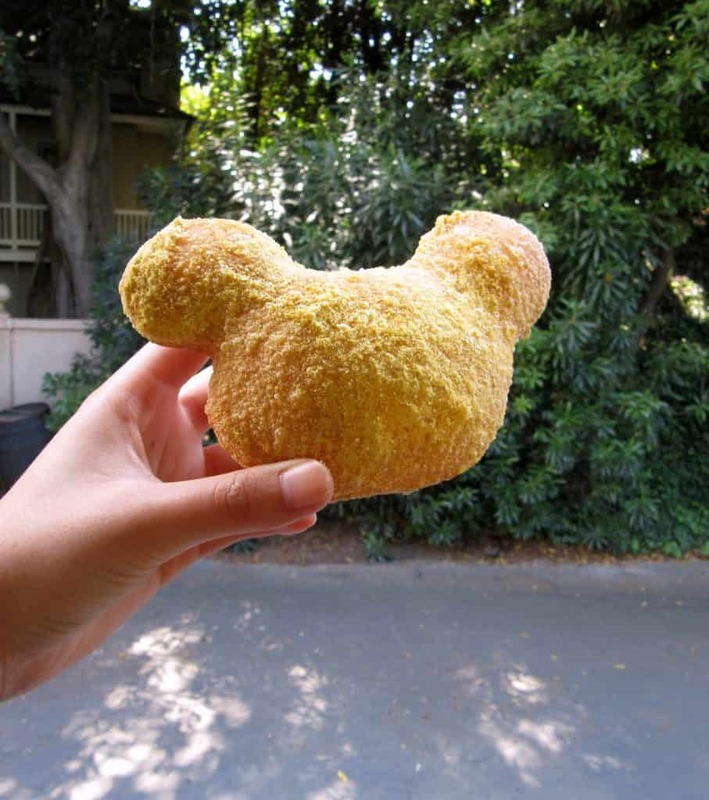 i always get a kick out of the mickey beignets (: they’re so magical looking! Whenever I get a cinnamon roll or cupcake where the frosting was overdone I do the same thing! I just run my finger across it and leave most of it on the plate. At least it wasn’t powdery and fairly tasty after that. then the fireworks didn’t happen? Yikes I’m so sorry that some things didn’t go as planned, but it sounds like you had a great friend to go along with you and then sit on the curb with you. That always can make things fun! using a finger sounds like a messy (but effective!) way to do that 😅 it was a bit sad that we didn’t get a chance to see the fireworks, but i mostly felt bad for the actual tourists, the people who rarely get to go. the fireworks are one of my favorite things there, and someone not getting to see them even though that disney ticket is $$$ is a little disappointing.